“Author Robert D. Kidera owes me big time. His debut novel in the promised McKenna Mystery series, ‘Red Gold,’ kept me up all night. Who can resist a good old-fashioned treasure hunt? ‘Red Gold’ is a thriller packed with deceit and danger but also compassion. McKenna is a damaged hero, but also one to root for.”—Vincent Zandri, New York Times and USA Today bestselling author of “Everything Burns,” “The Remains,” and “The Shroud Key”“If you’re going through hell, keep going…”Shaken by the death of his beloved wife and wrestling with powerful personal demons, Professor Gabriel McKenna leaves New York City for New Mexico to claim an inheritance from mysterious distant relatives. He finds something other than a Land of Enchantment.Unseen enemies threaten his life. Old friends turn up and rally to his side. Together they plunge into a lethal struggle for a 19th Century treasure, the fabled Lost Adams gold. McKenna enters a world of violence, passion, sexual abuse, deceit, and death that cause him to question his core beliefs and values, and even his sense of self. Desperate to find a way home, McKenna must first unearth the secret of an old family manuscript and risk his life against overpowering odds. He must rekindle his long-dead fighting spirit and discover new reasons to live and love. 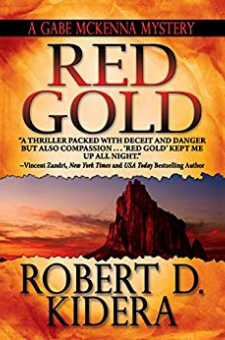 “If you enjoy first-class suspense and an author with a unique voice and style, then you will love ‘Red Gold.’ This novel is a masterful blend of mystery, action, and love story, all wrapped up in a wonderful cast of characters and beautifully-described scenes of New Mexico. Robert Kidera’s first novel is a real treat that will have readers demanding more.”—Joseph Badal, award-winning author of the Danforth Saga and “Ultimate Betrayal”"Red Gold" earned the Tony Hillerman Award as Best Fiction of 2015 at the New Mexico/Arizona Book Awards. It was also named as Best Mystery of 2015 and the best eBook of the year.